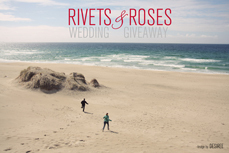 2012 Rivets and Roses Wedding Photography Giveaway // Desiree! Hello Blog Readers! Welcome to the official voting for the 2012 Rivets and Roses Wedding Giveaway! The three amazing couples below have all sent in their nominations and would LOVE for Desiree to be their photographer! The winning couple will be decided by you, the public! Please take the time to read each couple's story and cast your vote for who you think deserves to win this amazing giveaway! Their Story// These two officially met back in the 8th grade when Tyler was a lanky smart kid and Jessica was a pint-sized blonde. Their relationship survived high school and on thru college. Tyler and Jessica have grown together over the years and decided to take jobs at the Minneapolis/St Paul Airport together. They worked incredibly hard to save their pennies and have taken the opportunity to travel the world together. Their Story// Brent and Gena met at the preschool that she was working at at the time. His daughter happened to be in the class next door to Gena's. Brent was a divorcee and something about him just spoke to her. Maybe it was his calm, laid back demeanor or maybe it was his awesome shade of red hair. For Gena, it definitely was the way Brent was with his daughter – so loving, so patient, so genuine, and so tender. Something about him just made sense. The two finally went on our first date on a Friday the 13th. It was one of those beautiful summer nights in Minneapolis – the kind that make enduring three months of winter hell all worth it. He brought her flowers and they walked to the Modern in Northeast for dinner. Afterwards they went to the Electric Fetus birthday party and ended the night with some drinks at Mackenzie next door. All in all, it was a pretty perfect night. The most perfect thing about it was how a couple of really imperfect people were so at ease with each other the whole time. It just made sense. To Gena, she had met someone who felt like home. Their Story//A mere 3 years ago, Jennifer was perusing Match.Com looking for love, and spied a black and white photo of a coffee shop type boy thoughtfully looking at his Mac book. She thought he looked cute and quirky, so she winked at him and he winked back. The two started emailing long novels of flirty funny information back and forth. They connected over comic book movies and it was a sign, because Bart is a comic book artist! Their first date was on September 5th, and the highlight of the night was sitting in Mears Park listening to Haley Bonar while sneakily peeking at each other from the corners of their eyes. Jennifer and Bart got engaged December 15th, and unleashed a very funny YouTube video we made to announce their engagement.